We live in such a wonderful and caring community. The latest in show of this communities willingness to give and support their own was the fundraiser put on by Gary's Barber shop and LaRose's on Rt. 42. It started out with "March Madness" at Gary's Barber Shop on Main St. Every Wednesday for the month of March after school the barbers donated their time and gave $3 haircuts to Mason students and Faculty. All the proceeds went to three of their own youth that live in the community; Liz, Joel Brown, and Kortney Snyder. This was such an outpouring of love and support by everyone in our community. The month long fundraiser ended with the support of LaRosa's all day fundraiser. 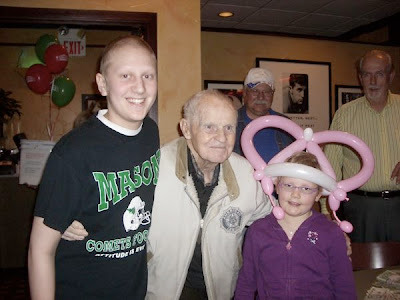 On April 1, LaRosa's gave 20% back of the total dinning bill to these kids of the dinners who came out to support them in their battle with cancer, this also included carry out. Liz and I were unable to attend LaRosa's because she was in the hospital receiving treatment. Randy and Jimmy were able to attend LaRosa's for support and thanks from the Lothrop family. The above picture is of Joel ,WW II Vet., and Kortney. I wish we could have been at LaRosa's to meet him; he came just so he could meet our brave kids in their battle. I could not imagine living in a different community and going through this ordeal. Thank you for everything you have done and given to my family. This is a very moving story. Here are kids fighting for their lives and a WWII vet who fought for their country. What a great world we live in.